From July 26th to July 30th, an intergalactic festival of squatters, anarchists & miscellaneous activists took place in Freiburg im Beisgau, South Germany: “DIY against the state”. It was meant to allow hundreds of participants to meet & share, putting forward the ideas of autonomous living, anticapitalist & anti-authoritatian struggles, through “do it yourself” practice. 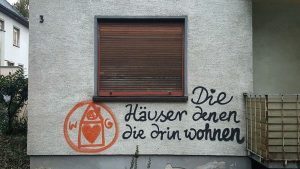 Tens of workshops, discussions, video-screenings and skill-shares were planned, together with actions & parties, throughout various alternatives venues in the city, like the KTS radical-left social centre, the Schattenparker wagenplatz, or the Susi housing co-op. While the event started well, with some 300 international participants setting up a self-managed camp on a squatted piece of land, the police was quick to react and sabotage the initiative, in a series of provocations and repressive actions, starting with the arrest of a participant in front of the KTS while a concert was going on, continuing with the eviction of the whole camping site by some 500 riot cops the next day (photos [1|2]), culminating in the total lock-up of the city centre & on Saturday, where the police chased demonstrators trough the streets, made hundreds of identifications, some 60 arrests, injured 7 people, and charged 3 demonstrators with made-up accusations, to prevent a Reclaim The Streets action from happening. An intergalactical activist & anarchist convention in South Germany from 26th to 30th July 2006. Squatters, artists and truckers from all over the world welcome! Freiburg is a small medieval town in the Black Forest in southern germoney, not far from what they call the Swiss and French borders. Especially during summer, it’s the perfect location for subversive activities of all kinds. For quite some time you can find there the same disgusting tendencies as in any place: State control and police repression keep getting worse, free spaces are getting smaller or evicted. The local autonomous centre KTS could all too soon be the last auto–organized, non–commercial venue in the south of germoney, and it’s only safe until 2007. The wagon site “Schattenparker” has a 12 – year – history of evictions, and three month ago, 30 trucks and trailers have been confiscated by the cops, leaving more than 30 people homeless. Since 4.th of July we have a new squat near Freiburg in Breisgau/ Germany. It is an old factory with a lot of nature around. There is enough space for trucks and some houses to live in. At the moment we celebrate a Free Festival more infos at http://www.people.freenet.de/southtek We hope that more people want to come and stay longer so that we can hold the place. It is worth for looking around! !